Like a Spin̈al Tap amplifier, my streak of running at least one race per year now Goes To Eleven. When I started out this year by setting my goal of 365 total miles, I thought for sure that somewhere along the way I’d be training for another race which would make that goal pretty easy. Then I lost a big chunk of summer, and found that I didn’t want my 10-year race streak to end. I started trail running on September first, really liked it, and mixed it regularly into my schedule. 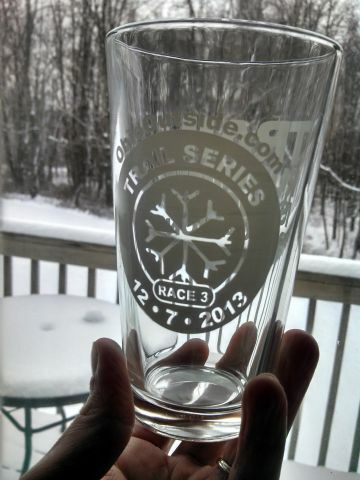 And a day after turning 43, I registered for the final race in this year’s Ohio Outside Trail Series. So last Saturday, Dec. 7, I bundled up and drove to the Munroe Falls Metro Park, arriving just after 8 a.m. for the 8:30 race. It was 22 degrees, but not too windy. A good layer of snow & ice on the ground. By the time I checked in, returned my race goodies to the car, and used the restroom, I only had to stand around for maybe six or seven minutes before the race, which was good. I had been dealing with a hot throat and clogged sinuses for a couple days, but it was just a cold – not flu – and dammit, I paid for this race, so I was going to run it. And it’s been my experience that the effort of running clears my head, and can usually push aside minor illnesses for awhile. There were fewer than 200 runners taking part in this 4.7 mile run, but even so, things were crowded on the trail for most of the first mile. It was odd, at the start, hearing the muffled footsteps of runners on snow-covered grass instead of pavement, but once we got into the woods, I felt very much at home. I’m glad I did as much trail running as I did at Quail Hollow, because it prepared me for the reality of slower times compared with road running, and for the climbs and descents, and the focus and energy and effort it takes. I wish I’d spent more time in the woods, in fact. 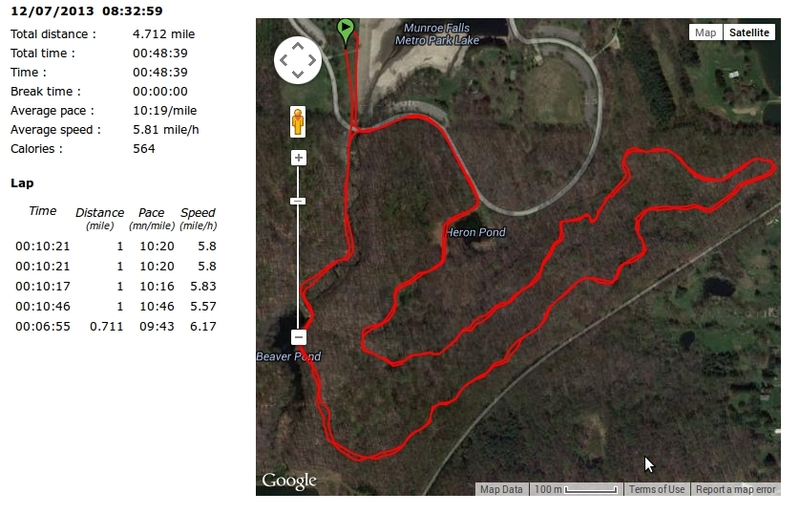 Based on the course photos and the trail description, I was expecting a wider and more level run – but the mostly narrow two-lap loop was very reminiscent of the wooded trails of Quail Hollow, with hills and drops and uneven footing. All the stuff I kind of love about trail running. What was different today was the snow and ice, which factored into the running mostly on the downhill stretches, since it kept me from freewheeling. The temperature was also a factor in my lung power, and kept me slower than I can manage on the roads – but again, I’d anticipated that. Week 48 – Two nearly identical four-mile road runs Nov. 30 and Dec. 1: Same route, same overall 9-minute pace. For no discernible reason, I felt better after the second one, though. Week 49 – 4.7 miles on Saturday, Dec. 7, as detailed above. After I got home from the race, I stopped being in denial about the cold I was nursing, and I didn’t run any more. That brings me to 344.2 miles. As of today (Tuesday, Dec. 10), there are 21 days left in the year for me to run 21 miles – which would put me just one-fifth of a mile over my goal.